In my previous post, I remarked that at Lorraine American Cemetery, the largest American WWII cemetery in Europe, a lone Citadel Man rests in peace – 1Lt Peter Franklin Cureton, Jr., Class of 1940 – a “fact” which just never has sat right with me. For that reason, and, because there is still so much to be learned about all our Citadel Men remembered here, I frequently go back down previous research paths to check if I missed anything, or if new information has come to light. 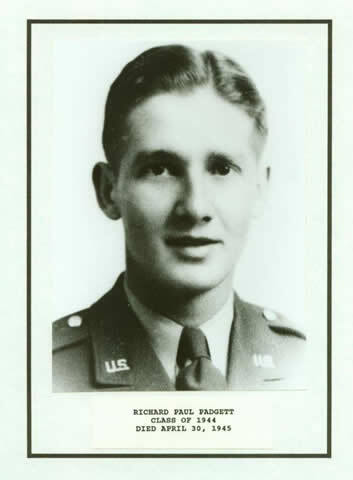 Richard Padgett hailed from Walterboro, South Carolina and majored in Political Science at The Citadel. He was a member of Cadet Company C his freshman year, and he was the 4th Battalion Ordnance Sergeant his junior year. The Standing Hop Committee photograph in the 1943 Sphinx – the school’s yearbook – shows him standing next to Cadet First Sergeant Creswell Garlington, Jr.
Posthumously awarded the Distinguished Service Cross, 2Lt Garlington rests in peace in Europe at Netherlands American Cemetery. Richard, Cres, and almost all of their 1944 classmates – known as “The Class That Never Was” – left The Citadel at the end of their junior year for the war. In Europe, Richard served with the 303rd Infantry Regiment, 97th Infantry Division. He was killed-in-action on April 30, 1945, just eight days before Nazi Germany surrendered. His regiment was operating at that time in an area of the Sudetenland along the German-Czech border. An In Memoriam page has been created for Richard, and all relevant pages – Alphabetical List, Lorraine, etc. – have been updated. Because he is a new addition to The Citadel Memorial Europe, there has not yet been time to research and collect information about him and his life. For Richard, and for all of these men, there is still much work to be done. There are many ways you can help and support the effort. Please contact me if wish to contribute or volunteer to help with research. Please visit our Support page to learn more. Together, we honor and remember our Citadel Men. Well done, another last resting place of a Citadel Man taken out of it’s anonymity! For more information about American World War II cemeteries in Europe, please take a look at my blog. I think you’ll be glad you did.